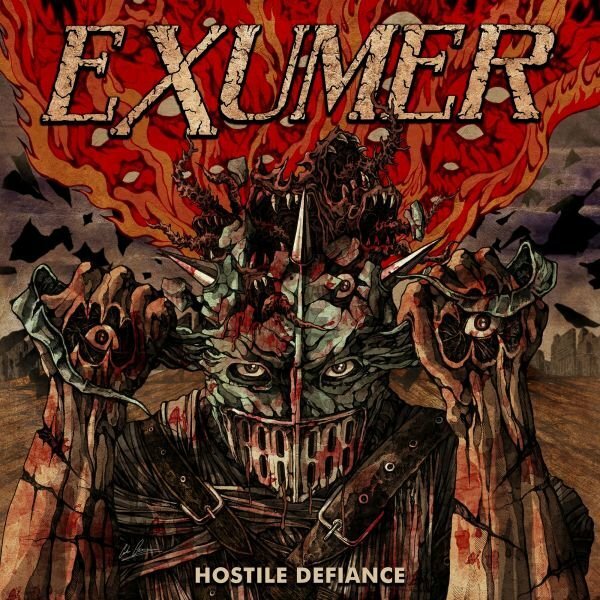 Δελτίο τύπου: «"Hostile Defiance", Exumer's fifth full-length, is exactly what its title suggests. A 42-minute full on attack, the thrash faction hold nothing back as they unleash hell as only they can, yet with more variety and dynamics than ever before. "We wanted to sonically progress, incorporating more melodic elements in the music as well as more rhythmic variety", states vocalist Mem Von Stein. 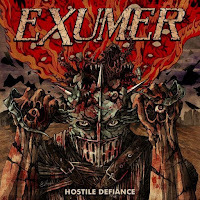 "We are a lot braver trying to create an up to date and relevant sound that can easily stand alone in today's thrash landscape without sounding trite or a throwback, and we're challenging the listener not to get too comfortable with one specific feel, tempo or pace. The result is a mixture of material comprising fast and thrashy numbers, melodic hooks and mid-tempo songs." While the album's title is overtly belligerent, the lyrical content is far deeper and more involved, informed by Von Stein's interest and understanding of mental illness, having been working in the field of psychiatry since 2002, and holding the position of licensed master social worker.